On a snowy Connecticut hillside, thawing out from an autumn nor'easter, sits a beautiful dairy farm -- run by two of the men you'd least expect. George Malkemus and Tony Yurgaitis are dairy farmers every Thursday to Sunday. But any other day of the week, you can find them in New York City -- running high-end couture shoe company Manolo Blahnik. CBS News correspondent Michelle Miller reports Malkemus and Yurgaitis have been president and vice president of Manolo Blahnik for more than 30 years. Over the course of their tenure, they've hobnobbed with female celebrities, sold countless pair of $800 stilettos, and built a brand every fashion-forward woman longs for. But their love of high heels is rivaled only by their love of heifers. And both are treated with the same passion. Just like their shoes, every cow has a name. And just like their customers, each cow is treated like a lady. Malkemus said, "When a woman walks into a party with a pair of Manolo Blahnik shoes and everyone says how fabulous she looks, it's the same way that we feel when somebody applauds one of these cattle that have been bred on our farm." In 1998, the partners in business and in life bought a defunct dairy farm across the street from their home in Litchfield, Conn. Their goal? Save it from developers -- and restore it to a fully-functioning farm. "At one time, Connecticut had 4,000 dairy farms, and now the state has about 120," Malkemus said. "So basically, farms have just disappeared all across the country. So part of the love that we had is the preservation of land, and preservation of farmland, in particular." Today, Arethusa Farm has more than 400 cattle. The farm employs more than 25 people full-time -- who do everything from milking, to bottling to scooping. It's a small business that's had a big impact on the local economy. Conn. State Sen. Andrew Roraback (R) said of the Manolo Blahnik businessmen, "George and Tony have lead by example every step of the way. They have given back to this community much more that they have taken from the community, and that is not lost on the people of this area." Last year, they chose to open a dairy in an abandoned fire station on the main street of sleepy Bantam, Conn. -- far away from New York City's 5th Ave. But don't let their taste and uniform of Italian cashmere fool you, Miller said. Malkemus and Yurgaitis are true dairy farmers every step of the way. Arethusa Farm manager Erin Hubbard said the two aren't at the farm all of the time, but when they are, "they are working." Yurgaitis said, "I come alive on the farm, I really do. I love it here." Admittedly, neither claims to do the real dirty work. Yurgaitis fancies himself the cheese man, while Malkemus takes pride in his perfect waffle cones. He said, "I have a tendency to make the largest waffle cones, so the customer really gets their money worth when they get a George Malkamus waffle cone!" And their employees couldn't be happier. 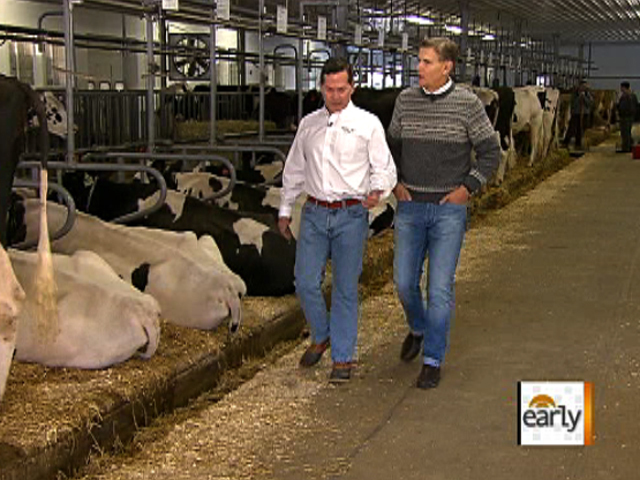 Hubbard told CBS News, "I am very proud to say I work for Arethusa Farm Dairy. ... We are a family." In addition to providing lifetime careers to local townspeople, Malkemus and Yurgaitis are providing for the next generation. A recent tent sale of their shoes raised $100,000 for a scholarship that will help send a child of a local farmer to agriculture school. "We have been very blessed in our life with our partnership and with our business and now with this farm," Malkemus said. "I mean, I think it's all about giving back." So whether farmer or fashionista, Miller remarked it's clear Malkemus and Yurgaitis have a certain flair for success - and - impeccable taste.